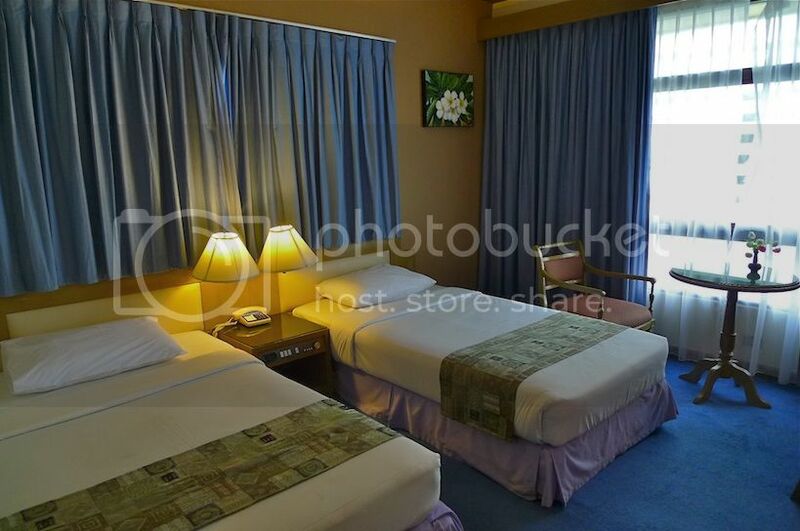 During my trip in Bangkok last February, my friend and I stayed at Pinnacle Lumpinee Hotel. 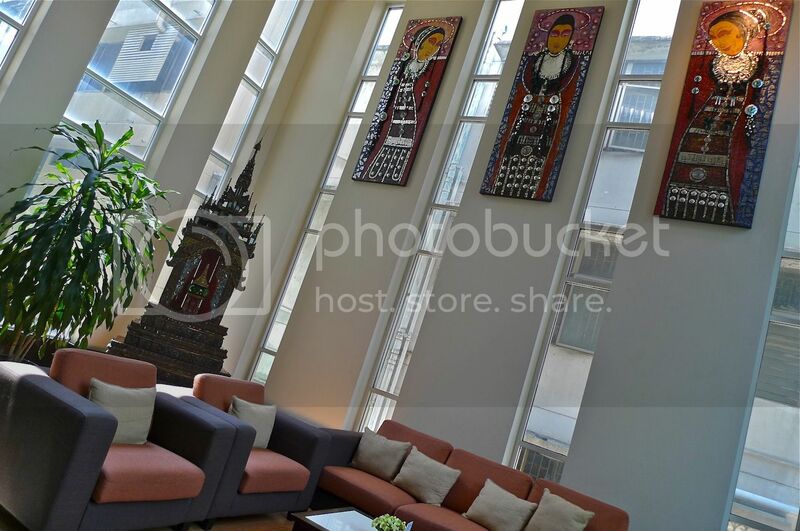 Located at Soi Ngam Duphli, off Rama IV Road, this 3-star hotel is convenient to get around Sathorn and Silom areas in Bangkok. 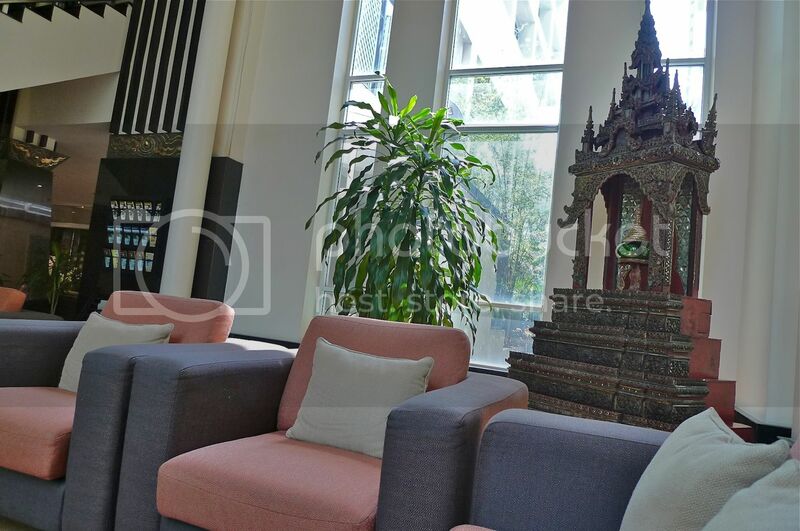 It is within walking distance to the Silom MRT (subway) Station, which also connects to the BTS (Skytrain) line, so in fact getting around Bangkok is pretty easy! 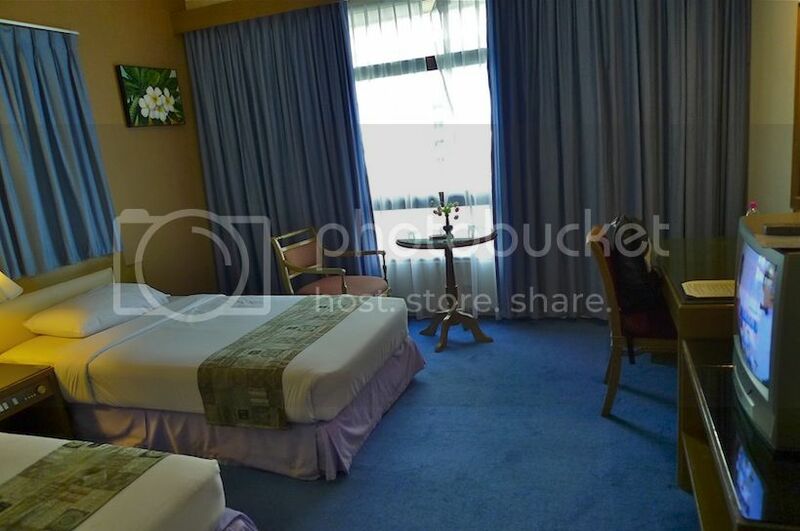 The hotel is about 10 minutes walk to the famous Lumpini Park and it is also very near to hyper mart Tesco Lotus and hawker stalls and shops, so its location is really quite good. Although the outside did not look impressive, I was quite surprised with the lobby area of this hotel. There were nice seats at the lobby. Did you notice the altar? Most Thai hotels have altars like this. 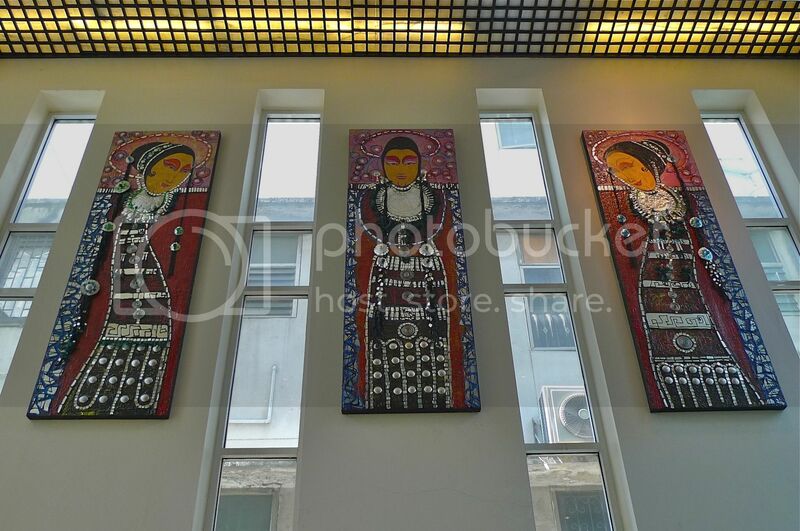 I like the pictures on the wall! I have to say the counter staff were all very nice - mostly warm and friendly. 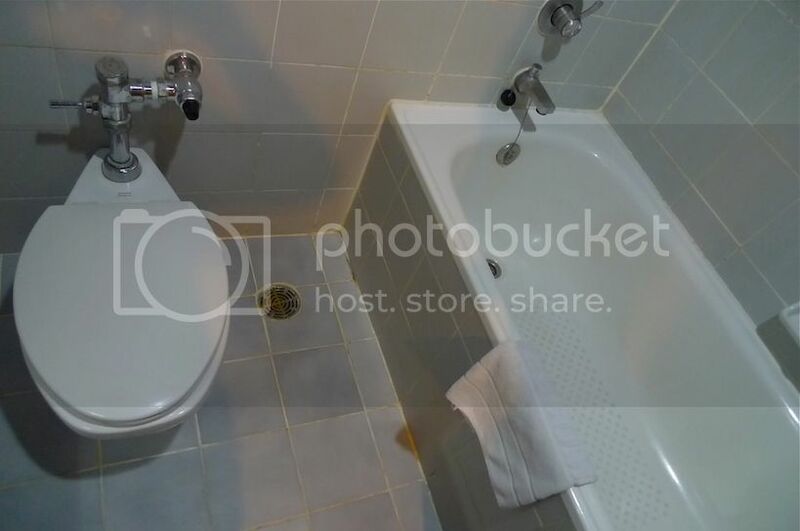 My friend and I had booked for a Standard Room. We were given one on the fifth floor of the hotel. I was quite happy with the room - it was clean and tidy. However, since the room was situated near the end of the corridor, we could not receive the complimentary wifi connection. I was quite upset but luckily, the Thai TV shows were so interesting, I was glued to the TV every night that I did not bother too much to go online! Oh! 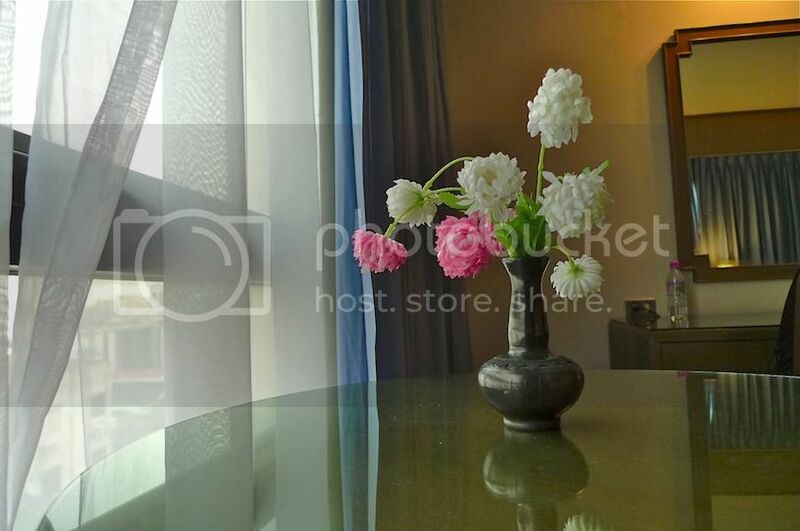 Look at the artificial flowers on the table! Maybe they need some water haha! I always fear dirty bathrooms when I go traveling, so it was such a pleasant feeling to see the bathroom in my room clean and spotless! 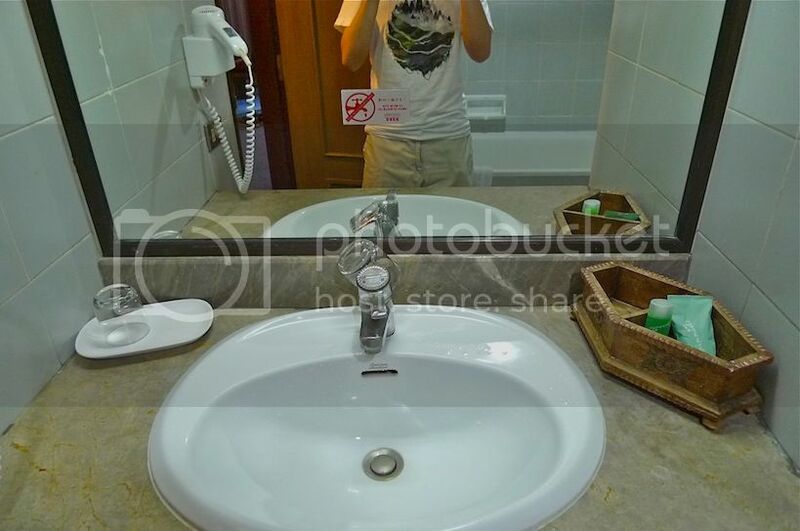 Took a picture of the sink. Did you notice a glass on that tap? Why was it there? Well, the vertical lever at the back of the tap was faulty. To unplug the sink, I need to push the lever down. 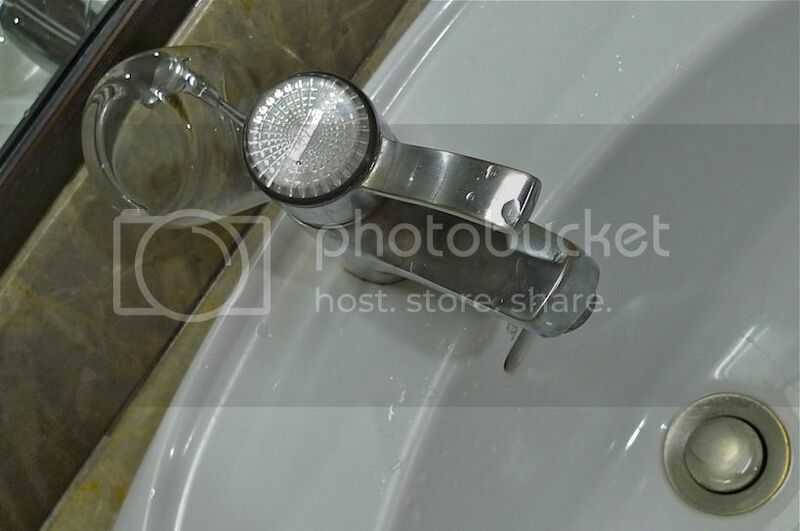 But the faulty lever would not stay down, so water was prevented from flowing down the sink hole. Instead of using my hand to keep pressing on that lever, I decided to put something heavy on it, like the glass. Am I brilliant or what? LOL! During my stay in this hotel, I spent quite a long time in the shower. Even my friend complained haha! The reason was, I fell in love with their lemongrass shower gel! It had such a nice lemongrass fragrance that I simply could not get enough of! I was so in love with this shower gel that I even asked the hotel staff where I could buy it. Or if they are willing to give some to me, or at the very least sell a few bottles to me. LOL! Unfortunately, the staff did not quite understand my request (their English were not that good!) so in the end, I gave up and thought of another idea. Well, my friend said I was crazy, and maybe I was. 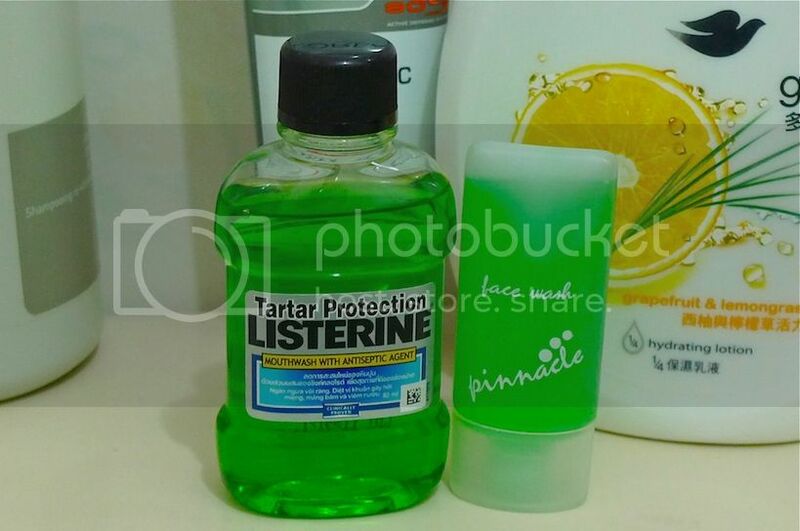 What I did was I went to Tesco Lotus nearby and bought a small bottle of Listerine for about 37 baht (RM3.70). I then returned to my hotel room, emptied the whole bottle of Listerine down the sink, cleaned the insides with water, and then filled it up with the hotel's shower gel! LOL! In case you are wondering, the hotel's shower gel did not come in bottles, otherwise I would have just taken the bottles. But the hotel's face wash came in bottles, so of course, I emptied them (by the way, I never use hotel's face wash) and replaced with the shower gel as well. Haha! The cleaning lady must have wondered how come the shower gel and face wash in our room got used up so fast but I am sure she knows the reason. LOL! The picture above was taken after I came back from Bangkok. That's why you can see the Dove shower gel there. LOL! I use Dove everyday at home. But you can be sure that the bottle of Listerine does not contain mouthwash and that face wash is not what it seems. Haha! 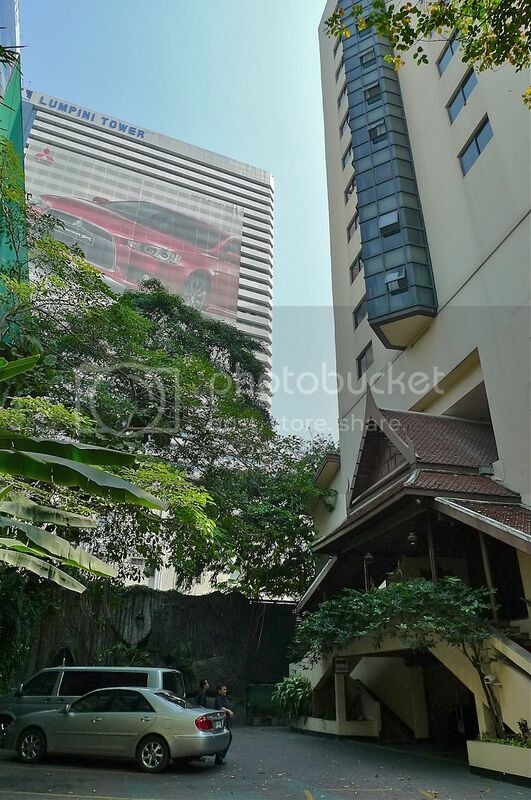 The breakfasts at Pinnacle Lumpinee Hotel were quite average but satisfactory, so I did not take any pictures. The hotel has a swimming pool and a gym but my friend and I did not make use of them during our stay there. For the price of 1,400 baht (RM140) per night, I thought the hotel was a pretty worthwhile stay, although I must say it did look somewhat old. Perhaps a fresh coat of paint or some renovation would help to make it look new and more attractive! Still, I would not mind staying in this hotel again IF I can get the same price and my room has wifi connection. 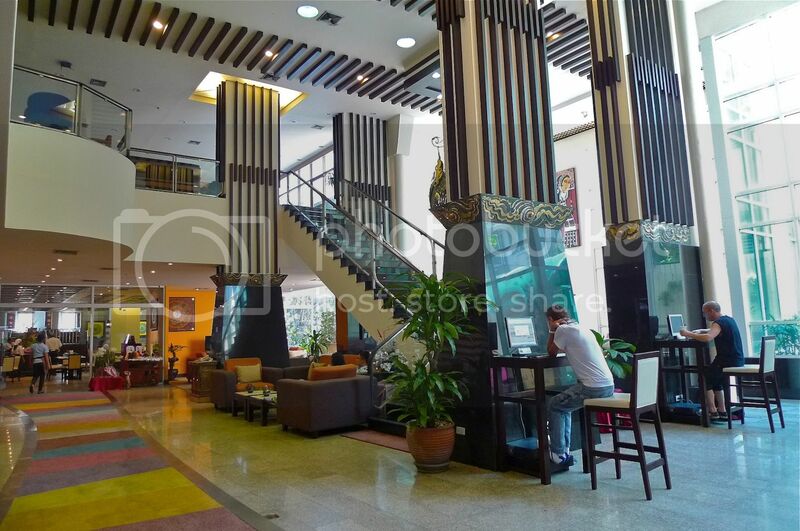 More details about the Pinnacle Lumpinee Hotel can be found HERE.